Ragweed is a plant that many people speak of but might not know for sure what it looks like. It is well known by name because it is the prime source of fall allergies in North America. And it is hard to identify because it is one of the most nondescript weeds in the plant world. There are no colorful berries on it, such as on bittersweet nightshade, and even when it blooms, its flowers can only dream of owning the character of dandelion's flowers. There are two common varieties of ragweed: common ragweed (Ambrosia artemisiifolia) and giant ragweed (Ambrosia trifida). Together, the two plants account for most of the cases of hay fever in North America in the autumn. 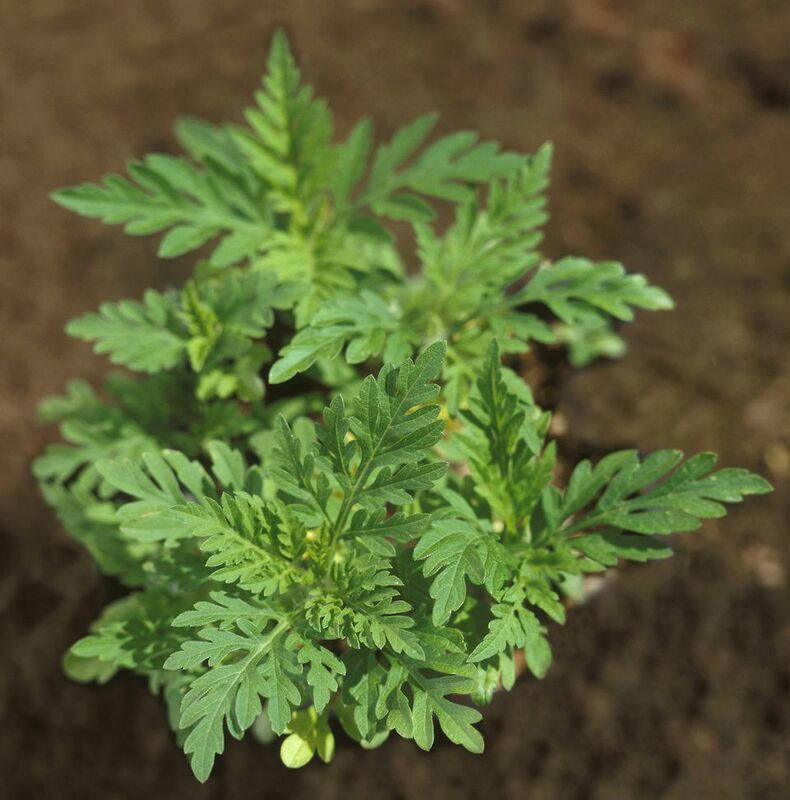 While common ragweed often is easily confused with some other plants, such as mugwort, it looks quite different from its close relative, giant ragweed. The leaf of the common ragweed plant is made up of multiple leaflets that have a fern-like appearance. The leaflets are essentially miniature versions of the whole leaf. Such leaves are sometimes referred to as "twice compound," meaning compound leaves that are made up of separate leaflets, which themselves are compound. Another identifying feature on the common ragweed plant appears with its initial leaves, those that first come out after a seed germinates. These typically have some purple speckling on them. Note, however, that other weeds can display an admixture of purple, so don't jump to any conclusions. Lamb's quarters (Chenopodium album), for example, another rather nondescript weed is often found with some purple in its leaves. The Ambrosia genus belongs to the aster family, but their blooms are nothing like the colorful flowers of New England aster, for example. Ragweed flowers are exceedingly inconspicuous. In fact, the casual observer may not even recognize them as flowers, since they appear as small yellowish bumps. The image here shows the flower spike of the male flowers of common ragweed. Using a magnifying glass, you would be able to detect the presence of five stamens on each of these male flowers. Ragweed is monoecious, meaning a single plant contains both male and female flowers. Ragweed's female flowers are even easier to overlook than its male flowers, as they are hidden in the upper leaf axils—the angles between the upper side of a leaf or stem and the supporting stem or branch. The bloom is succeeded by a fruit that is technically designated an "achene." It is brownish and, like the flowers, inconspicuous. While common ragweed isn't always short (its size depends on growing conditions), it can't match giant ragweed in stature. The latter can stand a staggering 15 feet tall. To put that into perspective, there are dwarf trees that don't come close to attaining such a lofty height. The "giant" in its name is justified. Indeed, it could just as easily be dubbed "the monster weed." Giant ragweed is especially problematic in agricultural areas because it spreads rapidly. Could such a plague of a plant possess any qualities to recommend it (even if only to play devil's advocate)? You bet. If you look hard enough, you can usually find something good to say about even the most undesirable of plants. Some caterpillars dine on Ambrosia, for example. Moreover, giant ragweed has been used by humans as an astringent, a skin disinfectant, an emetic, and to treat fever insect bites and rheumatism. Giant ragweed bears a "palmate" leaf. That means its shape resembles that of the palm of a hand. There are two leaf types on giant ragweed: one type has five segments (more closely resembling a hand), and the other has three. Don't let this discrepancy bother you excessively in your identification efforts. The fact is, if you find a very tall weed with leaves like either of the ones pictured above, there's a good chance you've encountered giant ragweed. There are other types of Ambrosia besides common ragweed and giant ragweed. According to the University of Tulsa, there are 21 species in North America. Ragweeds, generally speaking, thrive in dry areas, so it is not surprising that there's even a type found widely in the deserts of the American Southwest. That would be burroweed or "bur sage" (Ambrosia dumosa). Desert plant or not, this type of ragweed is just as problematic for allergy-sufferers as are other kinds. Giant ragweed blooms have similar flower spikes to those of common ragweed. The two ragweeds also have something else in common: both are plants that cause rashes. Brushing up against ragweeds with bare skin can give you a rash.